If only universities were in fact leftist organizations that favored radical social change, rather than the rigidly hierarchical, bureaucratic, and essentially medieval institutions they have always been. The truth is that universities aren’t all that powerful or influential–if we were, don’t you think we’d be better funded than we are in most state unis and colleges? But we’re handing out tickets to the middle class in the form of our diplomas, after all, so there’s only so much power and influence our ruling class will permit us to exercise. And the truth is that we faculty do a pretty good job of reigning ourselves in with our insistence on “maintaining standards” and our policing of disciplinary boundaries; and as though we’re not cutting off our own gonads, our governments also hobble us with pathetic state support. 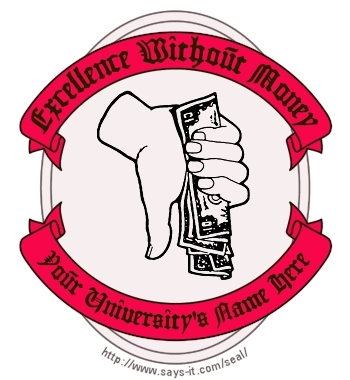 Yes, even the so-called radical, leftist, secular, statist (and/or fill in your own preferred insults here) faculty have internalized the “Excellence without Money” paradigm, as some of us called it in the budget-slashing days of the Great Recession. But, I guess it’s more entertaining to worry about what Middlebury College students are up to, as determined by their evil puppet-masters, we all-powerful Stalinist thugs who teach the arts, sciences, and most especially, the humanities. Watch out, Red State America. We’re coming for your children! And p.s., some of us live in your towns, right in your neighborhoods! Mwaah-hahahahahaaaaaaa! ← Marcia! Marcia! Marcia! A member of a Monstrous Regiment of Women pipes up a tune & smokes it. This week I found out that my state legislators have had a history of voting against university interests even though we are probably the largest employer in either district. I always just assumed they voted the way the uni wanted and never paid attention. That sure has changed this year. And I am not the only one. I sure hope indivisible can find some principled republican primary challengers. Preferably alumni. I just found out this week that my college doesn’t even have an office of affirmative action or anything like that to oversee civil rights law. In fact, I’ve learned that some of the women could probably sue under the FMLA. Indeed, when I pointed out that the Faculty Handbook has a “maternity leave” policy that reads like it was written by someone who has no idea about childbirth, and asked how this could be fixed, the issue was twice referred to as “benefits” rather than “rights.” This is a school that prides itself on its “mission” and commitment to “social justice.” I’m looking to doing something about this. My suspicion is that the absence of this office has something to do with the cost of running it. Much of the compliance requirements, like having Title IX officers, has fallen on the shoulders of faculty as part of “service,” and it is usually faculty in the liberal arts and social sciences who are most interested in civil rights. Hey, thanks for letting me know about your students and your new handle, former Clio B./L.! This is a Jesuit (not Catholic, they are careful to remind you) college. Still, I did some research and they are well behind the curve for comparable institutions on this and affirmative action, but right on target with the Excellence without Money. Charity will take care of it all, you know! I’m a Middlebury graduate (still live & work in Vermont) and I have been both sick and furious since the talk & protest. I was angry before it even started; it was co-sponsored by the Political Science department, whose criteria for co-sponsoring a talk were “is it about political science?” and “will people think it’s interesting?” Not a word about “is it actively harmful?” Then, since the talk, the protest, and the violence afterward, I’m getting regular constant communications from the new President saying nothing about their mistake in supporting Murray’s talk in the first place, and only spewing false equivalency narratives about how we owe him a respectful dialogue. It’s intensely frustrating; I’ve written them many times, but I’m not what anyone would call a high value donor, so I’m sure it’s in one ear and out the other. Amanda, keep writing! Keep putting on the pressure. I try to tag them on Twitter to let them know that it’s not just right-wingers up in arms. It’s those of us in the reasonable center, too. I disagree with the physical violence threatened at Middlebury, but it seems like PoliSci’s attempt to have him speak was dangerously naive and out of step with college needs. Historiann, I had the impression that Murray was invited by the Political Science department, not by the central Middlebury administration. Are you saying that the Middlebury administration should have “disinvited” someone the political science department invited? That seems like a bad precedent. Obviously, a college or university is not an open forum (not everyone gets to speak), but the principles on which we restrict access are academic principles, and I’m not sure I want a central administration overruling judgments made by departments. And the point where the response to Murray went wrong was not when people protested (they have every right to protest), but when they actively shouted him down. You write that Murray “is not exempt from experiencing the consequences” of his speech, but that principle would seem to facilitate the “heckler’s veto.” Actually, someone could argue that even the physical violence you deplore was a predictable consequence of his visit. I’m on a committee that will be asked to weigh in on endorsing them, and want the most compelling arguments possible against them. (I.e. “They are total twaddle” isn’t helpful). Anyone wanting to take a go will have my undying gratitude. The best rebuttal to high-minded but politically sterile and naive statements like these is just that colleges do not owe everyone with an opinion a platform to expound their ideas. Colleges and universities must indeed vet and “peer review” the value of bringing speakers to campus. What was the value to the students or faculty of giving Charles Murray a platform at Middlebury? He has a very prominent perch from which he’s been able to expound and publish his views in the nation’s most prestigious newspapers and magazines. His books are published by prominent presses. Students who want to understand his point of view have plenty of opportunities to do so, just as they can learn all about the Ku Klux Klan and the Nazis in history classes and at the library. No one is burning his books–they’re just protesting that he should be honored with their money and attention. Giving a guy like that–or anyone else on the Southern Poverty Law Center’s Hatewatch or Extremist Files radar–would give the impression that his ideas and opinions are a valid point of view. They are not. Even if they put him on stage with a Black Lives Matter activist or someone else to oppose him would give the impression that their ideas are equivalent. They are not. Something that right-wingers like to talk about is Truth. I’m no right-winger, but I agree that there is such a thing as truth. Some research is better and more valid than other research. Universities don’t owe any platform, let alone a “respectful hearing,” to Nazis, the Klan, or other hate groups. Why would Middlebury think they owed this to a man who’s been very successfully selling his discredited ideas about genetics and supremacy for more than 20 years? Historiann, it sounds to me as if you disagree with only one of the principles that Susan called “awful” and “terrible”: “No group of professors or students has the right to determine for the entire community that a question is closed for discussion.” I also disagree with this formulation: groups of responsible professors and students can determine for the community that their academic institution will not sponsor, for example, debates with Holocaust-deniers. Sorry to say, but these statements should be boilerplate for any institution devoted to education and pursuit of the truth. What’s amazing is that they are actually considered debatable. If Murray is a racist, then nail him on that through debate and not by physical attacks (BTW has anyone here actually read The Bell Curve? Plus, there is much more to Murray than that book, such as his proposals from a guaranteed income for individuals. This would not be out of place at a Bernie Sanders rally). Really? Do we invite Ken Ham to give talks about evolution? Do we debate Holocaust deniers or dig up members of the Dunning school or phrenologists to debate them? Or do we let them rest in peace with their deserved reputations? It seems like guys with Murray’s ideas had sway from the mid-19th C through the 1930s at American universities. I don’t think their ideas are really debatable any longer. FWIW, I’m so old I subscribed to The New Republic back in the day & read the execrable platform Andrew Sullivan & Marty Perez provided Murray & Herrenstein. It was shocking then, and remains even moreso now, unless you discount Andrew Sullivan’s commitment to “contrarianism” that led him to give a platform to patently racist ideas. You’re probably too young to remember or know this, but this book was even brought up in a press conference that Bill Clinton gave in 1994 and he was asked to comment on it! (Yes, back then we had presidents who were expected to know what big books were current, hard as it may be to believe.) The Bell Curve was a big deal, and its methods and conclusions got all the hearing they deserved in the public square when it first came out–more than it deserved IMHO. So yeah, I know the guy’s work. I don’t think it deserved the platform it got then, and I don’t think it deserves any more of our attention now. Back in the 1990s we knew it was an embarrassment. It’s too bad we know even less than we did 23 years ago. You said you know the guys (Murray’s) work. I asked if you had read the book. Have you? I read your link and understand the false equivalence arguments. The comparison of the Murray incident to Selma is patently ridiculous. However, two things about what was said there. First, it downplays the violence angle with mealy-mouthed statements about it being unclear about whether it was students or non-students and whether security or the protesters started it. I don’t believe from anything I’ve read here that you condone violence as a way of dealing with speakers whose views one finds objectionable or just plain wrong. Second, everything is framed in terms of the Bell Curve. He’s written a ton of other books between then and now. Was Murray even there to discuss the Bell Curve? I realize it may be tough for folks of your views to set aside, but agreement is (believe it or not) not universal that he was making the case for eugenics or declaring blacks inferior. And yes, I did read it as I have read many of his other books which are much more recent and pertinent to current issues. For example, the left would much better understand why Trump got elected by reading “Coming Apart” (maybe with a little “Hillbilly Elegy” thrown in), so if he was there to talk about that it was a big opportunity missed. Then they would be discussing the ways to address the needs of the people who voted for Trump, many of whom voted for Obama in the past two elections (so it’s surprising to hear them called racists), instead of continuing to bludgeon us with the current message. The latter approach is I fear only going to yield more, and maybe even worse if you can believe it, Trumps. These people are not the “deplorables”, as Hillary sneeringly referred to them, but are real people, fellow Americans with real needs that are not being met by either party. That’s what induced them to throw a “Hail Mary” by electing Trump. It was a move of desperation, and those usually don’t turn out well. The party that figures out how to reach these people will win future elections. And In case you’re wondering, I most emphatically did not vote for Trump. A big question for me is where do we draw the line between giving a platform to someone who deserves it and someone who doesn’t? Is it by mobocracy? I don’t think you would advocate that. Administration? Professors? Students? Given the campus climate today (I’ve been following this issue for a long time) of “safe spaces” and the fear of being damaged by hearing views that conflict with one’s cherished own, we’d be dealing with pretty small speaking pool and failing to prepare students for what it’s like in the real world where the protection of the campus bubble and the filters that go with it do not exist. What are your thoughts on that? Thanks for the compliment, but unfortunately I’m not too young to remember anything that happened in the Bill Clinton administration; I’m probably older than you. I am also not an Andrew Sullivan fan! And thanks for giving me a thoughtful response. I honestly thought you would tee off on me as a troll, but that is not why I’m here. I am interested in the exchange of ideas,as quaint as that sounds (see, I am old!). BTW, I came here from a link someone posted on the Journal of the American Revolution website. Clayton, you are welcome here. I get people who mostly agree with me on most points, but they all disagree with me on some points, and some disagree with me on most points. We just try to keep it clean & honest! One reason I don’t think I ever read The Bell Curve is that I’m already familiar with scientific racism & sexism, and the ways in which white intellectuals have tried to tie their perceptions of black inferiority and/or women’s inferiority with science and capitalism. I read a lot of Steven Jay Gould back in the 1990s–he took down The Bell Curve pretty thoroughly, BTW. So I didn’t feel I needed to spend a few days pouring over that book to understand its place in the larger intellectual history of how men at historically white institutions have dealt with and talked about people of color and women. Now, the only place I’ve ever written about Murray is here, on my non peer-reviewed personal blog, so I think that’s defensible. If I were an intellectual historian who wrote professionally on this subject, of course I’d have taken a different approach. I appreciate your consideration of the “deplorables” and what moves them. But I don’t think we can overlook the role of race and the nostalgia for a pre-feminist, Jim Crow America played in Trump voters’ imaginations of what he would do for them. I don’t buy the argument that Trumpers are all suffering–I think his modal voter was a white man in his 50s or 60s who makes something like $75,000 a year–IOW a traditional Republican. I grew up in the Rust Belt, so I’m very familiar with the kind of white voter who went for Obama in 2008 and then for Trump in 2016, as nonsensical as it seems to those of us who care about ideology. I can have compassion for their plights without respecting their politics. The fact is that Trumpers voted enthusiastically for a person who has gone about undermining their interests all along and continues to do so from his elevated perch, and sadly the poorest among them will pay the biggest price. I’m not sure that trying to capture them is worth the effort, versus more effective mobilization of the Dem base. The Trump voters are the ones who are stuck in an imaginary past, whereas the Obama/Clinton voters (who were the MAJORITY of us, after all) are looking to the future. “If only we faculty were the diabolically powerful leftist Svengalis that they imagine we are.” This, times a million. They won’t stop using their freaking phones! And “based off of….” But more than that: do they know any teenagers? any 20-year olds? Do the college students of their acquaintance take adults that seriously? If I were a leftist Svengali, I sure wouldn’t be advising students to engage in violent protest (even if I didn’t oppose that in principle) because it’s been such a huge, timely gift to the right and the conservative press, who otherwise would have to talk about the president. It seems to me as though in the past several years, the phone-fiddling has diminished. I wonder if that’s because our students now (undergrad anyway) had smart phones in high school, where they were probably confiscated if the students didn’t develop better phone discipline. Snake the recidivist criminal from the Simpsons attended Middlebury College. Aren’t all these “free-speech” kerfuffles about the Ivy Leagues? Isn’t this really just a way for the elites to piss and moan about how other members of the elite are raising their children? My students, even the politically conscious ones, and students of color don’t know who Charles Murry is. None of my colleagues, even the conservative ones, would bother inviting that fraudster to speak.